The Silver Fox loves brussels sprouts, so I'm always searching for new ways to prepare them. I found several untried recipes this past weekend and had to decide which I'd actually use. The first recipe, probably the best of the bunch, was discarded out of hand because one of its instructions called for coring three pounds of sprouts. I immediately formed a mental image that set me laughing so hard I almost cried. I could see myself visibly aging and developing a dowager's hump as I went after all those tiny cores. The other two recipes were much easier to do and I decided to try them both. Both were delicious, but they highlighted a problem that I've encountered before with members of the Brassica family. They do not photograph well, especially after they've been cooked. The recipe featured here tonight made the cut because it was the least ugly of the two. If you like brussels sprouts you'll find these to be pleasant. If you don't like them, nothing in this recipe will help change your mind. Roasted sprouts are simple to make and the caramelization that occurs as they roast gives them a decided flavor boost that I think you will enjoy. Here's the recipe. 2) On 1 large rimmed baking sheets, toss brussels sprouts with olive oil, season with salt and pepper and spread in an even layer. Roast in oven for 20 to 30 minutes, until brussels sprouts are tender and browned in spots; turn pan, back to front, and stir brussels sprouts halfway through roasting. Sprinkle with Parmesan cheese, toss and bake for 1 more minute, or until the cheese is melted. Transfer brussels sprouts to a bowl and serve. Yield: 6 servings. Cook's Note: Recipe can be doubled. 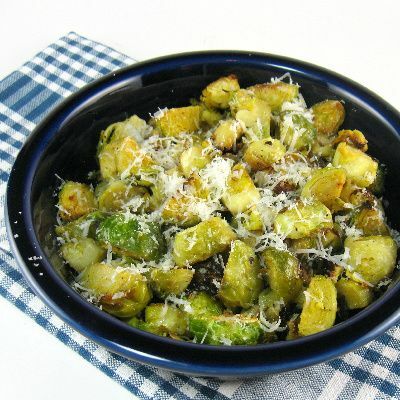 The brussels sprouts can be baked up to 2 hours ahead; rewarm them before serving.